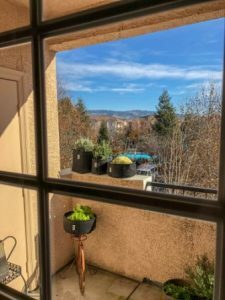 Urban gardening is a trend that is quickly expanding in scope. In fact, there has been a 29% increase in urban gardening since 2008. There are many good reasons for an individual or community to start an urban garden. 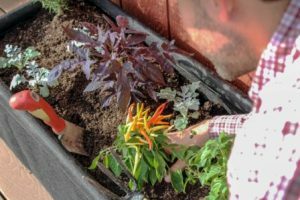 Aside from the basic connection one feels to his or her food after growing it, starting a garden can save money and help strengthen bonds within a community. Community gardens, in particular, offer a place for people to work cooperatively to produce food or beauty that can be shared with the general public. However, it’s not just community gardens that are shaping the way we view horticulture. An increasing number of individuals are converting lawns and rooftops into productive urban gardens as well. Perhaps the biggest difference between urban gardening and gardening in the country is the space available. Most urban gardens have a limited amount of space so many growers place efficiency and production at the top of their priorities. Simply put, urban growers understand they need to get as much out of their given garden spaces as possible. This need has led to the development of a wide variety of products and techniques specifically aimed at increasing the efficiency of a garden. 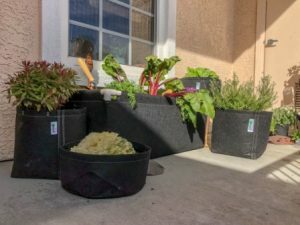 One of the most basic, yet influential, techniques used in urban growing is container gardening. Container gardening refers to the use of containers to hold the soil and/or root mass of the plant. There are many different planting containers available, but they are definitely not created equally. One particular line of planting containers, GeoPot, is designed to outperform all the rest. 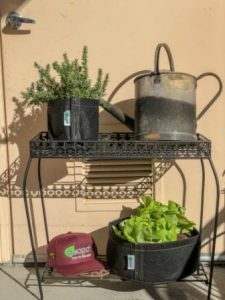 GeoPots are square bottomed fabric containers and are ideal for urban growers who want durable, breathable containers and who also wish to maximize their horizontal spaces. The GeoPot product line gives horticulturists an extremely durable potting container solution for virtually every growing environment. GeoPot containers are constructed of the thickest, non-woven polypropylene material available. The quad-stitched construction allows the container to withstand constant moisture and prolonged UV exposure, while retaining its structural integrity (even during irrigation). In addition to its impressive construction, other advantages of using the GeoPot containers include air-pruning of the roots, better aeration, increased drainage and natural temperature regulation. One of the largest advantages of GeoPot fabric potting containers is how they “air-prune” a plant’s roots. This prevents plants from becoming root bond which is a common issue with tradition planting containers. Air-pruning occurs when a root extends to the edge of a GeoPot container. Once the tip of the root touches air, it “air-prunes” which triggers the growth of fibrous, lateral root branching. 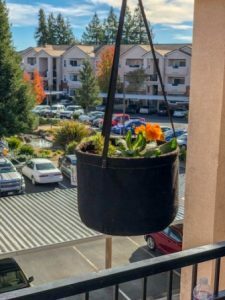 This cycle repeats itself and the overall effect is a well-developed root system in a fraction of the time it would take in a traditional planting container. The fibrous feeding roots stimulated by a GeoPot container are more effective at absorbing nutrients. This means the fertilizers and plant additives will be put to better use. 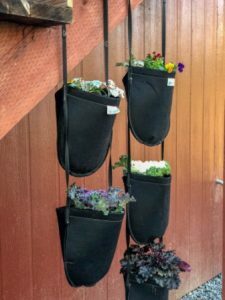 Plants grown in GeoPot containers will also make more efficient use of the given space within the container by filling it almost entirely with healthy feeder roots. Due to the heathy root structure, plants grown in GeoPot containers will be stronger and more efficient at both water and nutrient uptake. GeoPot containers are built from a sturdy, porous fabric that allows air to enter the root zone from all sides of the container. This means the plant’s roots have access to oxygen around the entire planting container which maximizes aeration. The unmatched aeration provided by a GeoPot container not only provides the benefit of air-pruning, but also helps to support beneficial microorganisms in the soil. Most beneficial microorganisms are aerobic, meaning they thrive and survive in an environment rich in oxygen. Therefore, if a root zone has more oxygen available, the beneficial microbes will flourish and the pathogenic microbes are less likely to establish. When the drainage of a planting container is slow or compromised by a mass of tangled roots, the soil can become anaerobic. Without proper drainage, the soil in a planting container will stay wet. When a soil or medium is constantly wet, there is never an opportunity for fresh oxygen to enter the root zone. This creates the perfect environment for pathogenic fungi and/or bacteria. GeoPot containers offer urban gardeners the best drainage possible of any type of planting container. The GeoPot’s fabric thickness not only provides durability, it also helps to warm the growing medium early in the season and keep the delicate root zone cool during late season heat waves. The soil in GeoPot containers will remain cooler on hot summer days because of the evaporative cooling effect. As the sun warms the container, the porous fabric allows air to enter and moisture to exit, thus producing the evaporative cooling effect similar to a plant’s natural transpiration. GeoPot has created a wide variety of planting containers to meet the various needs of horticulturists. All GeoPot containers are constructed of the highest quality materials and are designed to meet the demands of the urban gardener. This is the original breathable fabric container in the GeoPot fabric container lineup. When the GeoPot’s stylish or unique ultra-strong quad stitching (sewn with high quality bonded polyester thread) is examined, it is plain to see that these containers are built to last. The GeoPot is available in sizes ranging from 1/2 gallon up to 400 gallons. It is an excellent, multi-purpose container that can be used for virtually any application. These GeoPots have all the same advantages as the original GeoPot, but with added handles for easy transport. The GeoPot with Handles is available in sizes ranging from 1 gallon up to 30 gallons. The 15 gallon GeoPot is ideal for growing mid-to-larger size fruits and vegetables such as tomatoes, artichokes, peas, cucumbers and eggplants. The GeoPot Transplanter with Velcro Seam is an innovative product designed to ease transplant shock and the labor associated with transplanting. 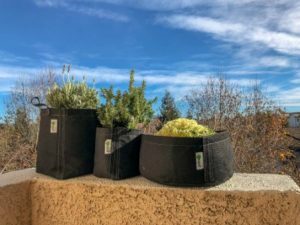 These containers are made from the same geo-textile fabric as the original GeoPot, but with an added Velcro seam which allows the side of the container to be opened for quick and easy transplanting. The GeoPot Transplanter with Velcro Seam makes transplanting easier than with any other type of container, but it is the reduction of the stress commonly associated with transplanting that makes this product so great. The GeoPot Transplanter with Velcro Seam is available in sizes ranging from 1 gallon up to 7 gallons. The GePot Transplanters are perfect to use when germinating your seeds, developing healthy root ball, and transplanting with minimal stress to your plants. The GeoPlanter is an easy to assemble, breathable fabric planter. The GeoPlanter is framed with PVC piping to provide a rigid, framed bed for the plants. The GeoPlanter is reusable and will usually last three years or longer under normal gardening usage. The GeoPlanter is available in a wide variety of sizes to meet the needs of virtually every grower. Furthermore the GeoPlanter costs substantially less than a traditional planter bed. It is easily assembled by a single person in a matter of minutes, which means you spend more time gardening and less time assembling. The G-Lite breathable fabric container was designed for horticulturists who are cost conscious, but still want the advantages of a quality fabric potting container. The G-Lite fabric pots are made of a slightly thinner material and have twin stitching on the side as opposed to the quad stitching and thicker material of the GeoPot. The G-Lite containers are still sewn with a high quality bonded polyester thread and can withstand constant moisture and UV exposure. The G-Lite containers are available in sizes ranging from 1/2 gallon up to 10 gallons. The G-Lite is an excellent choice for the cost-conscience gardener who still wants the benefits of air-pruning for a healthier plant. The G-Lite with Handles offers all of the same benefits as the regular G-Lite container, but with convenient handles for easy transport. The G-Lite with Handles is available in sizes ranging from 1/2 gallon up to 10 gallons. The G-Natural is an eco-friendly planting container made from burlap, a loosely woven fabric made from jute fibers. Jute burlap is organic and 100% naturally biodegradable within 2-3 months. Just like other GeoPot containers, G-Natural is completely breathable; allowing air to enter the root zone and creating a healthy environment for the roots. The G-Natural is well-suited for establishing the root balls of trees that will be planted at a later date. After allowing the tree to safely establish a well-developed root ball, the tree along with the entire G-Natural pot can placed in the hole that was dug for the tree. There is no easier way to transplant a tree or shrub. The G-Natural is available in sizes ranging from 1 gallon to 7 gallons. Urban gardening will surely continue to grow in popularity. Urban growers who want to maximize production in a given space will need to implement techniques and products that can increase overall efficiency. The GeoPot product line offers growers the ultimate fabric planting container solution. The GeoPot’s natural air-pruning ability, along with increased aeration and drainage, makes it the logical choice for urban gardeners. After all, urban gardening is all about maximizing production in a given space. GeoPot containers will help horticulturists make the most efficient use of space while providing the optimal environment for a plant’s root system to thrive. For more information call 800.681.1757 or visit GeoPot.com.